Click to download a copy! Employees: We have 52,082 employee caregivers, of which 3,676 are physicians and scientists and 11,889 are nurses. With 26 institutes providing care in 140 subspecialties, patients come to us from all 50 states and 135 countries around the world. Locations: We are home to a 170-acre main campus (with 59 buildings), 10 regional hospitals and 19 full service family health centers throughout Northeast Ohio; and we have locations in Florida, Nevada, Toronto and Abu Dhabi. Research and education: We have 1,965 residents and fellows in training and 107 accredited training programs; our total grant and contract revenue is $188 million and our total federal revenue is $118 million. 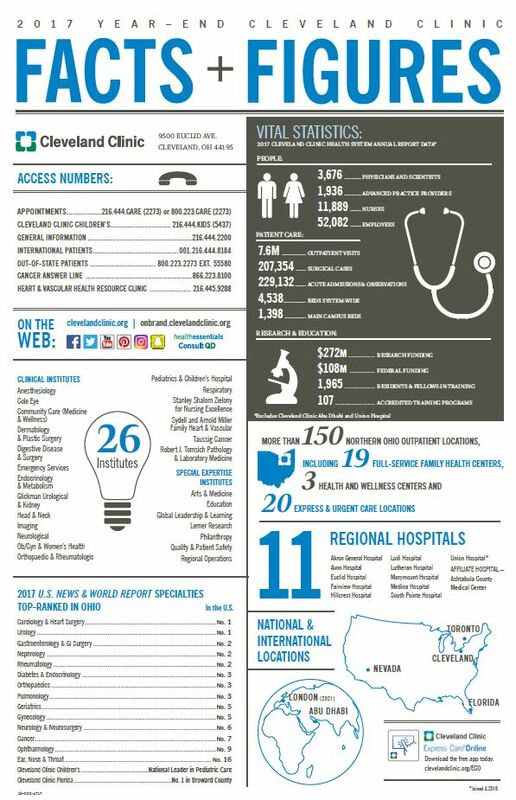 Cleveland Clinic serves the community by providing uncompensated health care to those in need, engaging in a broad range of medical, research, education and training programs, and supporting community health initiatives. In 2017, our community benefit contribution totaled $809 million. On average, our Critical Care Transport team makes more than 6,000 transports a year and has transported people from around the nation and from 27 countries.